It is always an honor to be asked to write a commissioned work to commemorate a special occasion in the life of a church, school, community group, or in honor of an individual. Below are some examples of commissions I've written for various groups. Commissioned by the Midland High School Chorus, Midland, Michigan (Robert Sabourin, director). Ruthie has arranged the "prequel" to her very popular "America the Beautiful" (BL276), skillfully setting "America" (My Country 'Tis of Thee; Thesaurus Musicus, words by Samuel F. Smith) for three-part mixed chorus and optional baritone. Beginning with an optional intro, the song starts a cappella and builds verse by verse to a powerful conclusion. While it is magnificent on its own, an alternate ending that enables a segue into her arrangement of "America the Beautiful" creates a stirring patriotic medley. Suitable for school (wonderful for end-of-year or concerts with a patriotic theme) or church use (great for Sundays near Memorial Day or July Fourth, or other patriotic services). This arrangement of the beloved hymn based on the immortal FINLANDIA theme by Sibelius is true to the spirit of the original while adding a freshness through the addition of an optional organ part to the piano accompaniment with optional flute. Thoughtfully and artfully arranged for the volunteer choir, this heartfelt choral expresses the comfort of God's promises. The third verse offers a chance to feature the men's voices, followed by a lovely SSA section. Commissioned by the First United Methodist Church of Arab, Alabama, in honor of Eleanor Cobb and her many years of dedication and service, and based upon her favorite hymn. Commissioned by the Highlands Presbyterian Church Family, in honor of and in celebration of twelve years of musical leadership by their Director of Music, Maria Wydra-Rohloff. "Lead us heavenly Father, through the storms that surround; guard us, guide us, keep us, bring us out on higher ground ... Carry us forward, into the light. Lift us up, lift us high above the night, out of our darkness, by Your power and Your might, carry us forward..."
Commissioned in honor of Eileen and Robert Newton's thirty years of inspirational music ministry at St. Andrew Presbyterian Church, Groton, Connecticut. "... I was created for praise, designed to reflect Your glory; to show the world Your grace, to tell all the world Your story. You alone are the Potter, and I am but the clay; a vessel made by You, created for praise... "
Commissioned by Composers and Schools in Concert (CSIC) fir the Frederick Law Olmsted Academy South Chorus in Louisville, Kentucky, with words inspired by texts submitted by the students. Commissioned for the dedication of the new organ at First Baptist Church, Keller, Texas, this powerful work by Ruth Elaine Schram is scored for mixed voices with organ accompaniment and incorporates the hymn "Like a River Glorious." Additional text by John Parker. Commissioned in honor of the 30th anniversary celebration of "Growth In Faith," Inc. in Seminole, Florida, based upon the original theme song by Joyce Mendini and Dinny Siersema. "...Grow me, Lord, grow me through and through, so that every part of me can be used by You. Mold me, Lord, change me day by day. Fill the yielded heart of me, and grow me, Lord, I pray... "
Commissioned by the First Presbyterian Church of McAllen, Texas, and by Walter Passmore, longtime choir member and friend, on the occasion of their 100th anniversary celebration. "... As we celebrate a century, worshipping as one, we lift our hearts in praise for this precious, sacred place. Hear our prayer, hear our song; keep us safe, keep us strong as we pass the torch along to another generation ..."
This tender song of Thanksgiving and praise by Ruth Elaine Schram and Joseph M. Martin is unforgettable. Compelling yet gentle, it is easily learned so that the emphasis can be placed on the expressive qualities. Commissioned in honor of Elizabeth Monk on the occasion of her 100th birthday. Commissioned by the Chancel Choir of First United Methodist Church, Anniston, Alabama, in honor of James Roberts' 25 years as organist, this lovely anthem incorporates his favorite hymn, "For the Beauty of the Earth" by Folliot S. Pierpoint and Conrad Kocher. Unison children begin by stating this hymn text and melody, then later this works in partnership with the original material sung by adults, "... Lord of all, Creator of all things; Lord of life, Lord of Lords and King of Kings; Lord of all, this prayer to You we raise: that our life may be a hymn of grateful praise..." Suitable any time of the year. Commissioned by and dedicated to the seniors of Edsel Ford High School, Dearborn, Michigan (Steven H. Olsen, director). A beautiful song of encouragement and appreciation, in honor of graduates everywhere who face the future with the intention of building upon the firm foundation laid by their education, and with appreciation to all those who helped along the way. Commissioned in loving memory of Mary Ellen Penrod, who served as choir director at Rummel Church of the Brethren in Windber, Pennsylvania, for over 50 years. Commissioned in honor of Susan Weimer's many years of faithful service to the music ministry of Hope United Methodist Church, Torrance, California, and based upon Hebrews 12:1-2, her favorite passage of scripture. Commissioned by friends and family in honor of Judy Feasel Jones for her 17 years of leadership at Macland Presbyterian Church, Powder Springs, Georgia. Voiced for SATB and piano, with optional Violin and Cello parts, and based upon Psalm 23, her favorite passage of scripture, as well as two of her favorite hymn texts (also based on Psalm 23). "Every need I have, my Shepherd already knows, my Shepherd already knows, and has promised to provide. Every longing of my soul will be satisfied, my soul will be satisfied; He has promised to provide. Jesus is my Shepherd, I will follow where He leads me... "
Culminating with an optional segue to O God, Our Help in Ages Past (St. Anne by William Croft), this anthem provides an engaging and uplifting new melody to the beloved Isaac Watts text. Excellent for New Years, dedication services, or any worship service, the title aptly describes the ennobling spirit of the text and music. Commissioned by the Chancel Choir of the Ascension Lutheran Church, Montgomery, Ohio (David Bezona, director), for the dedication of their new sanctuary. 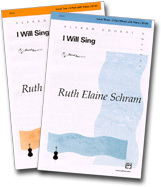 The Roland Park Country School of Baltimore, Maryland, commissioned Ruth Elaine Schram to compose the Centennial Song for the school's 100th anniversary. 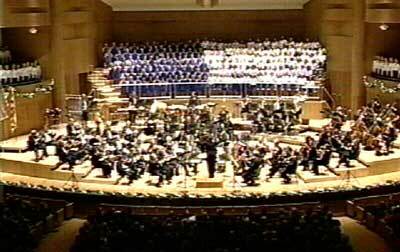 This twelve minute work was premiered in October 2009 at Meyerhoff Symphony Hall, accompanied by the Baltimore Symphony Orchestra. Commissioned by the Stockdale High School String Orchestra, Bakersfield, California, as a gift from John Gage, their conductor, upon his retirement. Beautiful, flowing medley of three beloved carols: "Silent Night," "Away in a Manger," and "O Holy Night." Commissioned by the Plymouth-Canton Educational Park Choirs, under the direction of Jennifer L. Kopp, based upon a poem by Dennis Neumann. This piece, perfect for graduation, celebrates the growth and change that takes place and challenges us to move on, leaving the "safe" and familiar behind. "... So, why are there wings, if not to fly? And why are there sails, if not for winds and seas to try?..." Commissioned for the dedication of their new sanctuary by Bella Vista Community Church, Bella Vista, Arkansas (Mike Walkup, Director of Music). This powerful song celebrates the function of the church in the life of the believer. Commissioned in honor of their 175th anniversary (September 2011), this song was written for Emmanuel United Methodist Church, based upon scriptures and ideas submitted by the choir members. A Call to Worship based on this song was published by Word Music, in the collection "Instant Introits and Amens." Commissioned for the 200th anniversary of Edenton United Methodist Church, Edenton, North Carolina, this powerful setting of Matthew 16:17-19 is aptly set by Ruth Elaine Schram. The familiar text is one of the best-known foundational scriptures of the mission for the church: "Upon this rock I will build my church; and the gates of hell shall not prevail against it..." Appropriate for worship services, dedications, and other commitment days throughout the church year. Commissioned by the Congregation of Young Harris United Methodist Church, Athens, Georgia, for their Centennial Celebration, and set for SATB voices with Piano accompaniment, with optional Flute and Handbells. "Yesterday, You are God, and today, You are God, and tomorrow, and forever, evermore the same. Worthy of our love, worthy of our praise, worthy of our faithful service, yesterday, and today, tomorrow, and forever..."
Commissioned by the Ernesto Serna Honor Choir of El Paso, Texas, in honor of their beloved Fifth Grade teacher, Dolores Serna Batres. Song of appreciation to this precious woman who dedicated her life to teaching children, and who left an indelible mark on all the lives she touched; based upon thoughts, artwork, and notes of appreciation submitted by her former students.